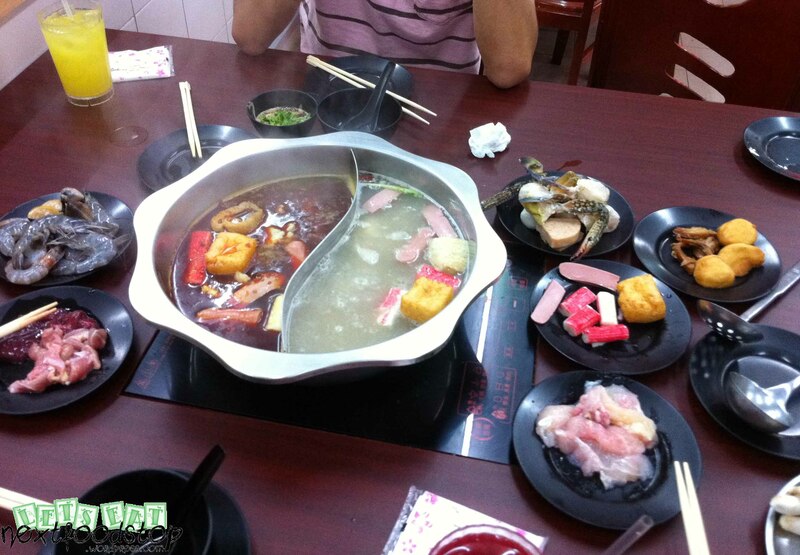 Steamboat in the comfort of aircon and individual hygienic pot! No more arguing over the type of soup base or busy cooking and serving others in the same table. If you want to eat, you better cook on your own! Choose your soup base from a choice of: JPOT Superior Broth, Bak Kut Teh, Herbal, Laksa, Silky Porridge, Tom Yum and Vegetarian. Top up a few dollars for free-flow of drinks! 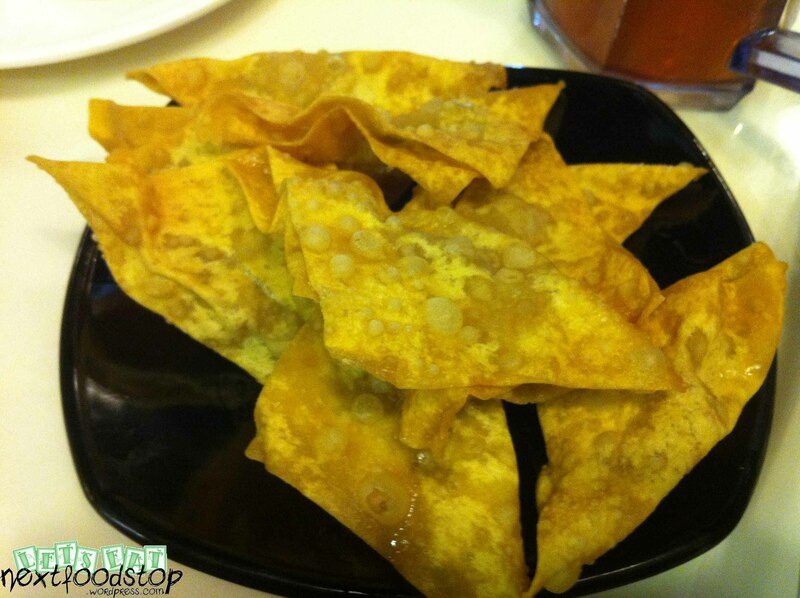 One of my favourites is ordering this crispy tau kee and fish skin. 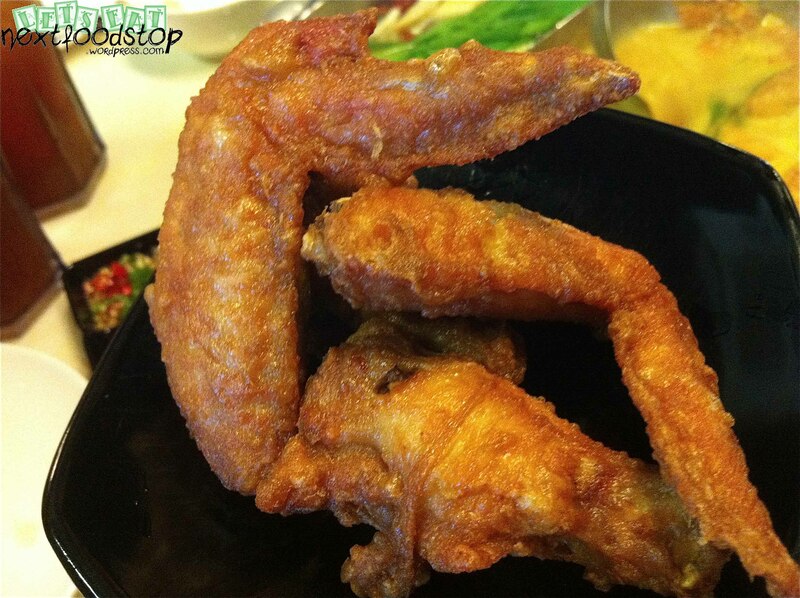 Though slightly pricey, you are sure that the food you are eating is of quality. 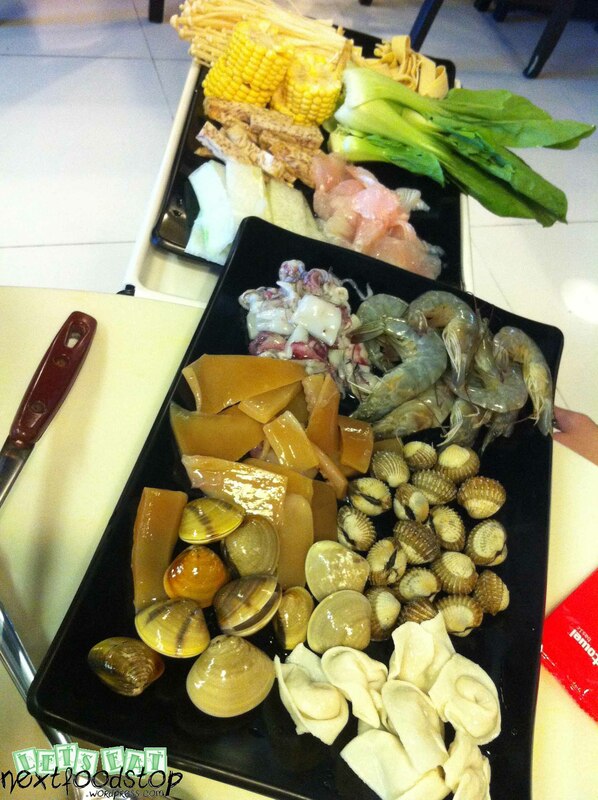 The seafood are fresh and beef is very sweet. 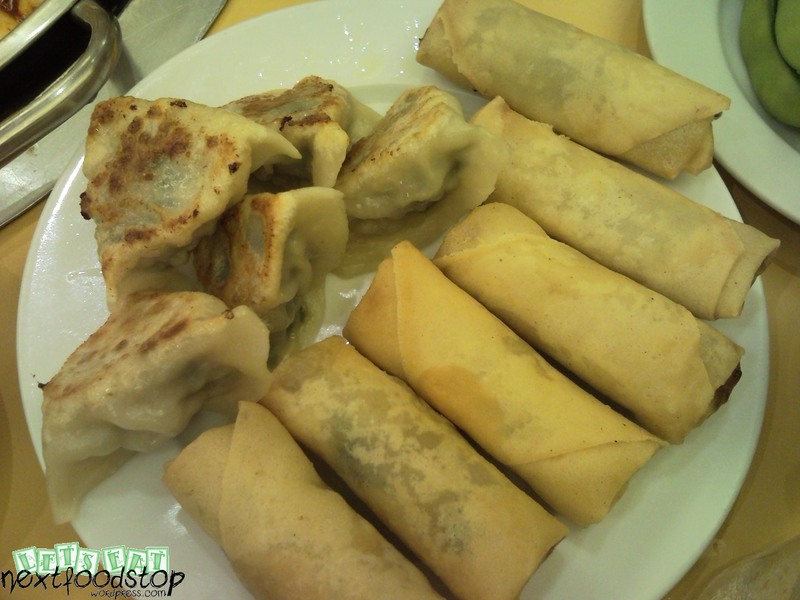 The fish paste noodles and dim sum are tasty. 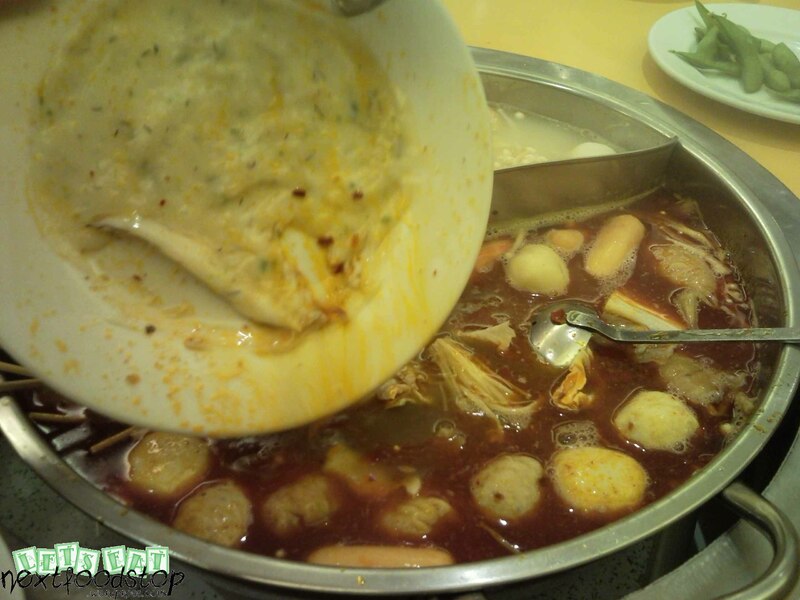 There is a good variety of meat balls, seafood, vegetables and comfort carbohydrates. Prices exclude 10% service charge and 7% GST. Jumbo membership rewards available! Hi readers! I’m back with a post! It has been a very hectic period – preparation for my examination, juggling with work and gig performances. To make matters worse, my computer kept giving me countless problems. I finally got myself a Mac Airbook just in case my computer fails me again. I’m so glad I bought my Mac and I’m gonna be a Mac-convert! Thank you for your support if you’re one of those who click on this blog occasionally to check for updates. 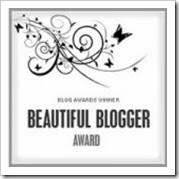 Of course not to forget those who subscribed to my blog! 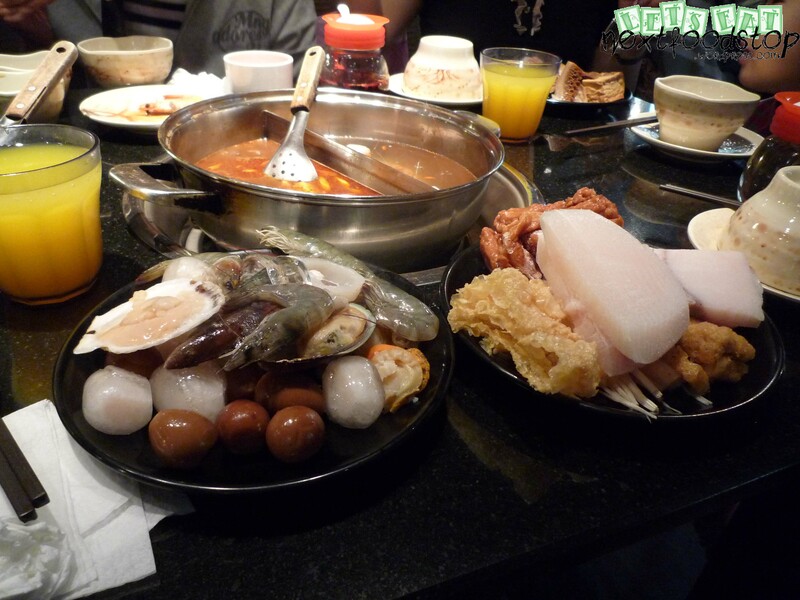 Today, my usual clique and I finally went to eat laksa steamboat buffet that we have been talking about for months. We went there for lunch today and there was only three tables on a public holiday. It was quite good as we were served promptly and the place was not stuffy and “steamy”. Best of all, we were sitting under the cooling air-con unit. The restaurant is clean and when you step in, the floors were not oily nor was the air smelly. 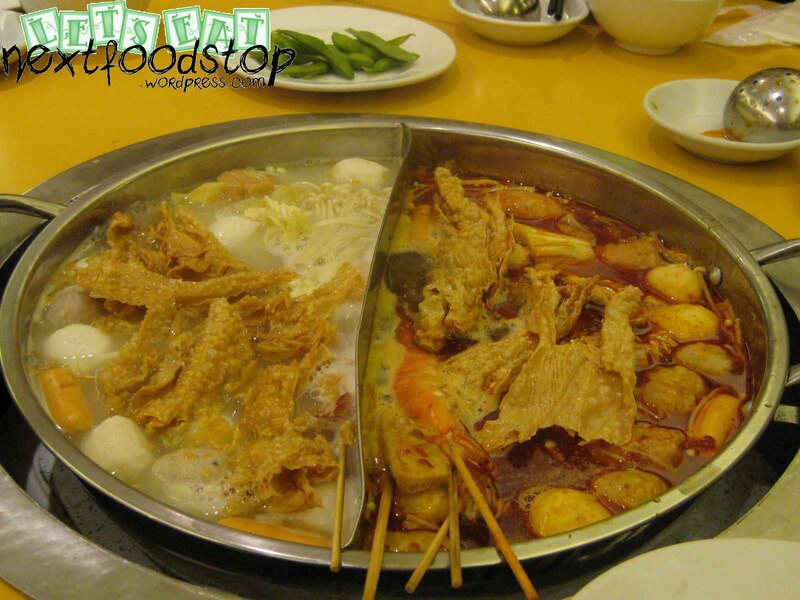 You can choose 2 from 5 soup base – Signature Laksa Broth, Sze Chuan Spicy Ma-La, Chicken, Herbal or Seafood Soup. We had the laksa and herbal soup today. The laksa was fragrant but a pity as it was not spicy at all. The herbal soup was a good contrast to the thick laksa soup. However, the laksa soup didn’t get too “jelat”. It just got a little tad salty at the end. I was disappointed that they didn’t serve any laksa leaves to go with the laksa broth. Neither was there peanut sauce for a steamboat fanatic. 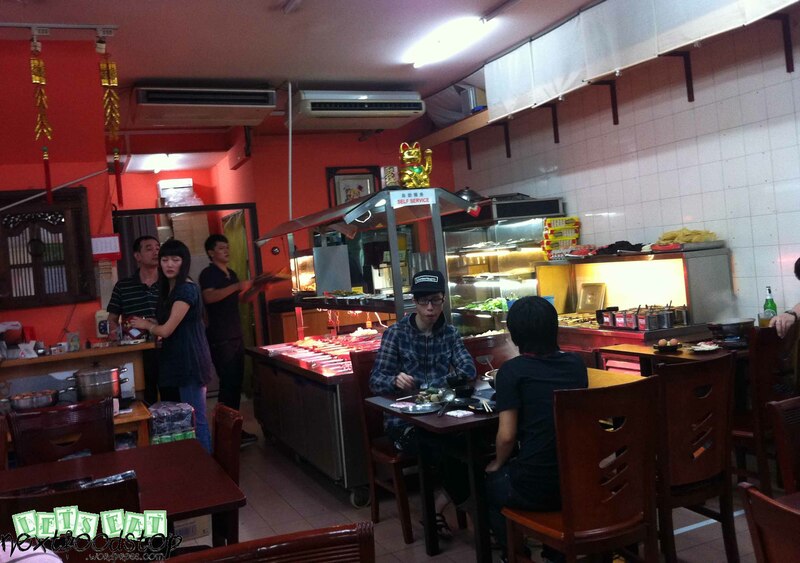 They only had coriander, chilli oil, sesame oil, chilli padi, sambal chilli and soy sauce at their condiments table. Besides the usual steamboat items, I was actually impressed with their readily cooked food – cold jellyfish slices, prawn paste deep-fried chicken wings, deep fried bean curd in Thai chill sauce, deep-fried wanton, spring roll and chicken nuggets. Take note that these were only cooked upon order, so the chicken wings were not cold! The wings were not dry and hard. And so were the bean curd and nuggets. 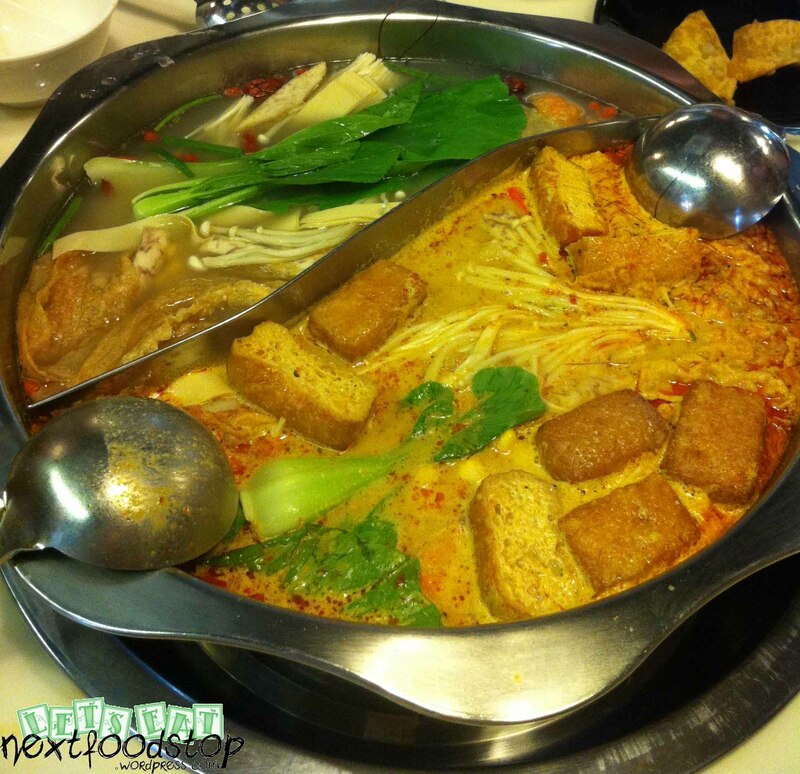 I liked their choices of tau kee, tau pok and tau pi that goes very well with laksa. Not to forget – cockles!! Neither of my friends ate them! But I totally enjoyed the cockles. How could one eat laksa without cockles??? Request for the table under the air-con unit, otherwise you’ll be sweating away. Prices exclude 10% service charge. There is no GST. 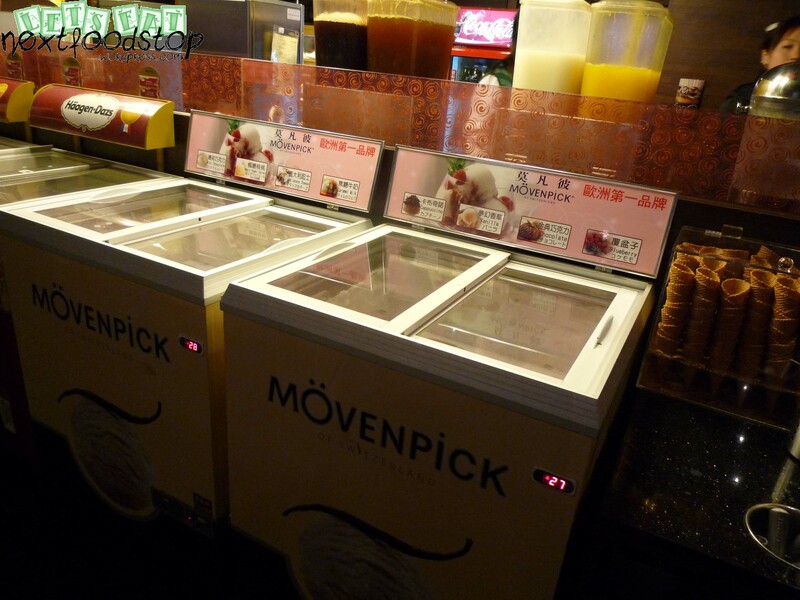 This place serves free-flow of 8 Hagen Dazs and 8 Movenpick ice-cream to choose from! EAT ALL you can!!! However you are only given 2 hours. We all left the place with an ice-cream cone in our hands, stuff with as much ice-cream as possible. You have to make reservations in advance because they are very packed during meal times. 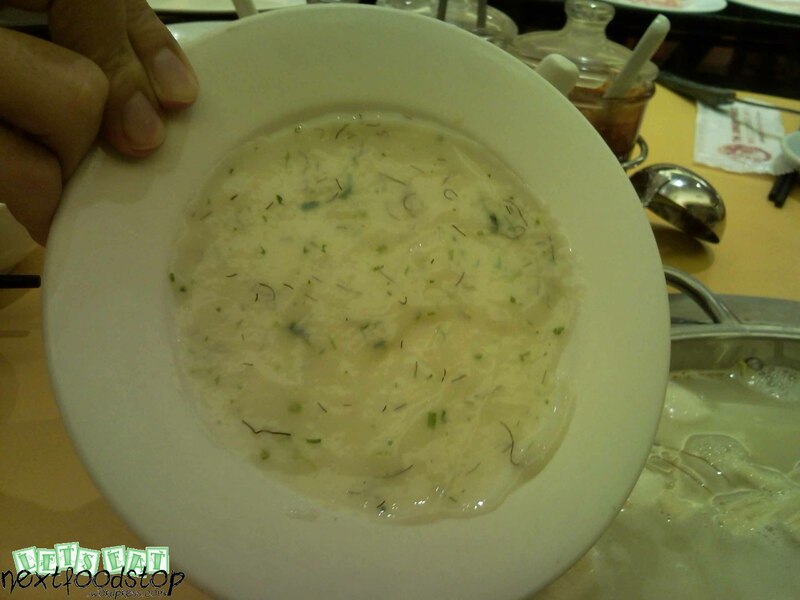 There are 4 types of soup base to choose from – 麻辣锅 (ma-la)，蔬菜精力锅 (vegetable)，东北酸菜锅 (preserved vegetable) and 膠原蛋白锅 (collagen)。We chose the ma-la soup and vegetable soup. 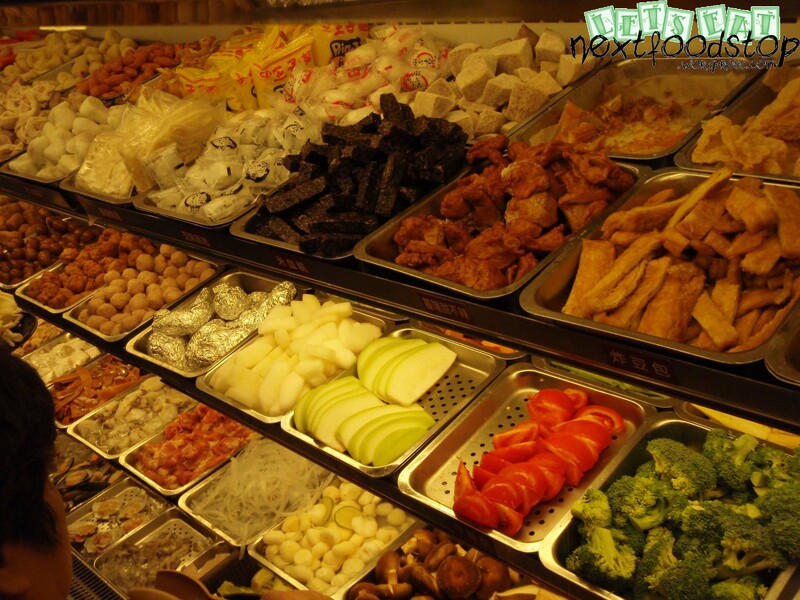 There are 101 types of food to choose from, and meat are freshly cut upon order. Meat include America’s Angus beef! 黑毛猪培根（白肉），黑毛猪梅花，美国小肥牛，澳洲小肥羊，顶级海鲜，手打花枝，各种菇类，etc. 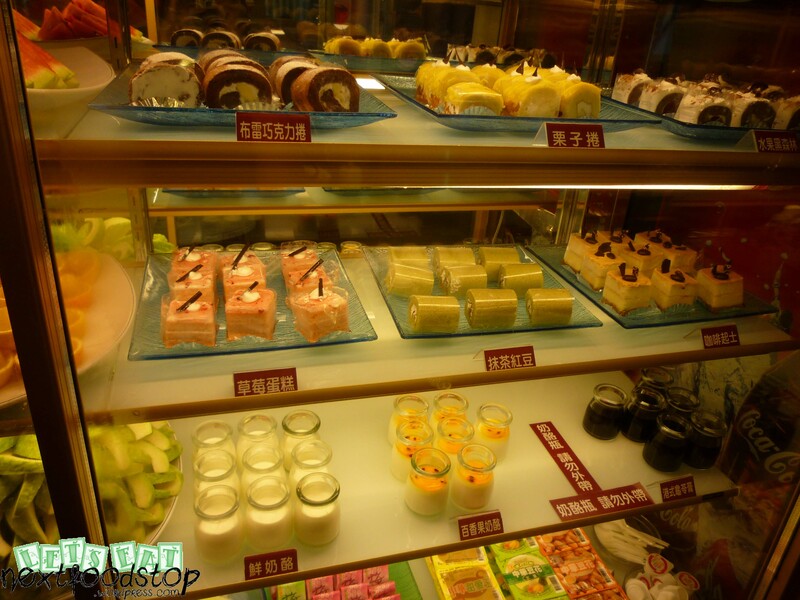 Besides all the fresh food, there are also many choices of tea, fruits and desserts to choose from. 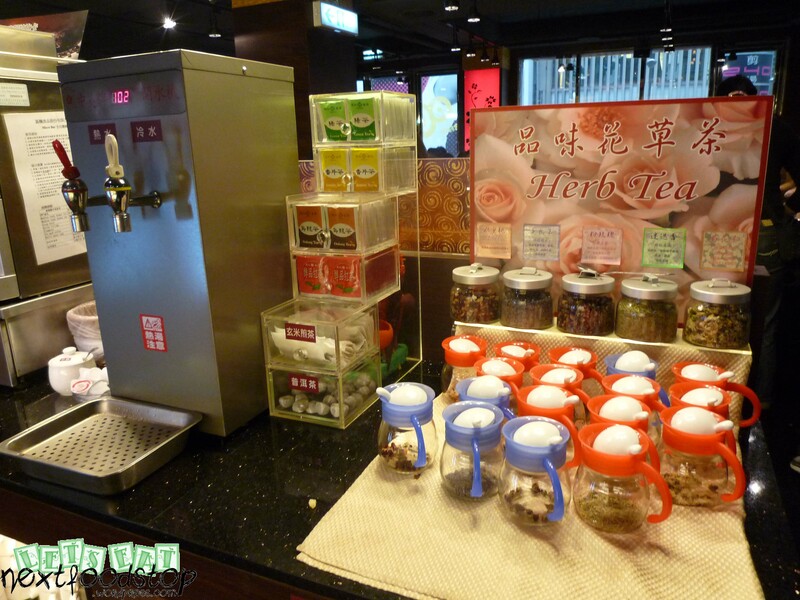 PLUS, free-flow of Taiwan beer! Really spoilt for choice!!! Customers can bring in their own beverages or alcohols in. They do not charge for this. Definitely a MUST-go because it’s really cheap and the food is good! You’re sure gonna have a great time with your friends! On top of this, additional 10% service charge has to be included. Been searching high and low for a similar taste of 麻辣火锅 (ma-la steamboat) in Singapore ever since returning from Beijing some 4 plus years ago. That was the first time I tasted ma-la in a unhygienic shop in Beijing. It was so difficult getting acquainted to the numb and spicy fusion of taste. However, the second time I tried that, I got to like it. The third time was addiction. So back to the story, I haven’t found a taste in Singapore that is identical to what I tasted in Beijing. This restaurant here is so far, a decent tasting one. It is real spicy and a little bit (yea, sadly only really a little) of numbness. 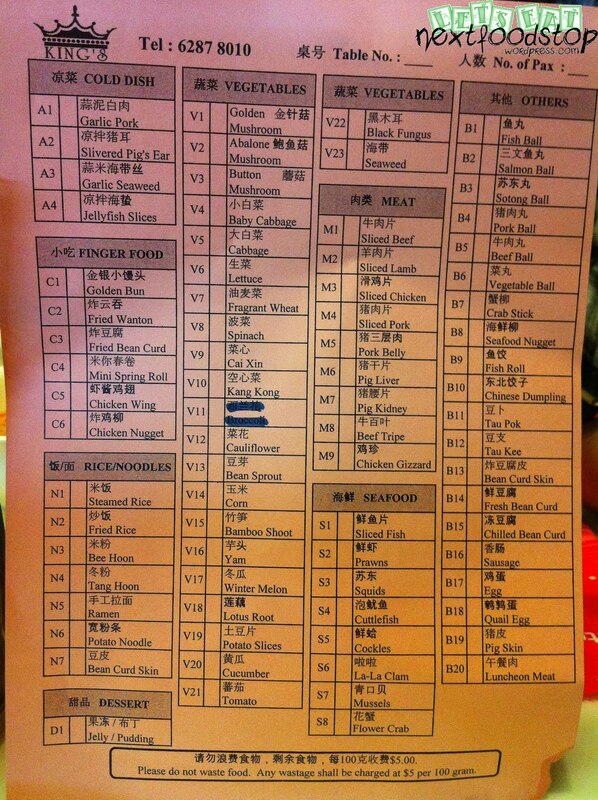 The cost of the steamboat buffet is not cheap. It is easily $30 odd for lunch and nearly $50 for dinner. The variety of steamboat items, I won’t say they belong to the high end and luxurious kind. One good thing is they have air-condition. So you don’t really sweat. 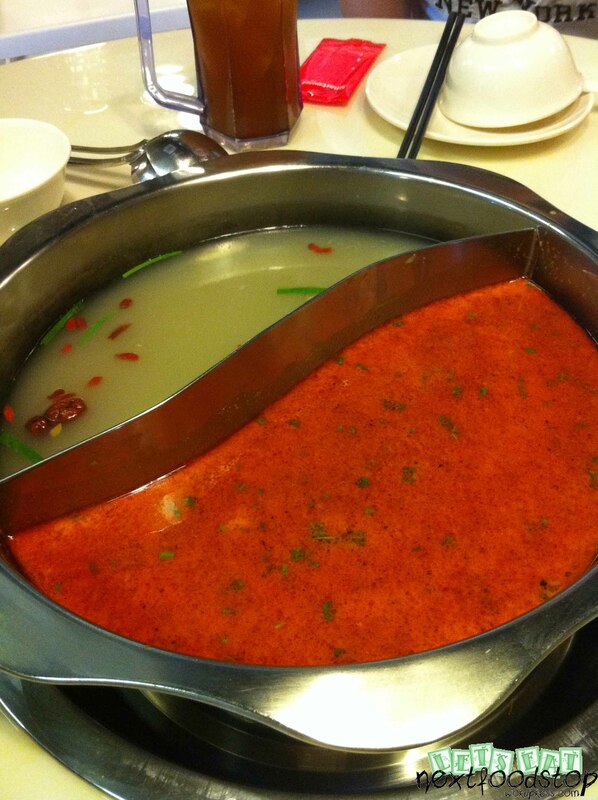 You can choose two broths for your steamboat. They have a specialty – their fish paste. It is cooked as shown in the pictures as “Step 1, 2 and 3”. You pour the soup base over so that the bottom of the fish paste gets a little cooked to get peeled off. Then eventually the whole fish paste drops into the soup. 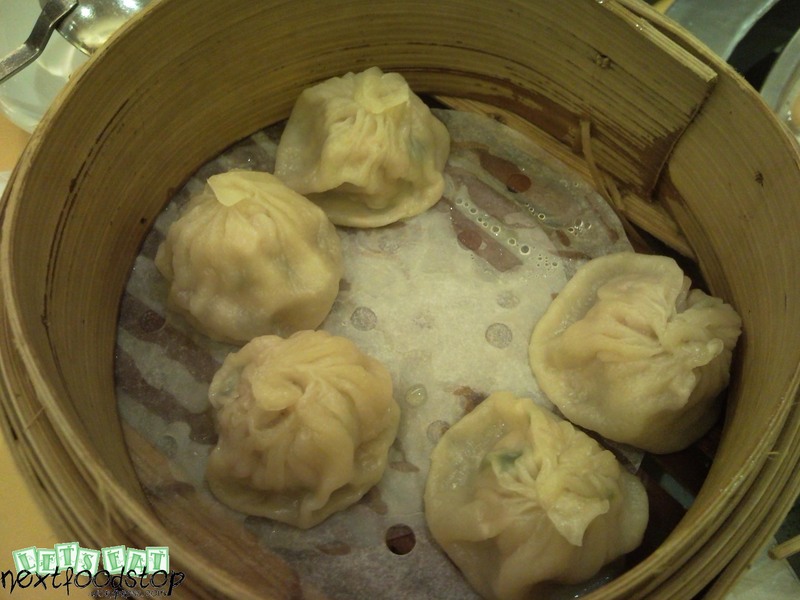 The restaurant also serves complimentary xiao long bao, pan-fried dumplings and desserts. I like their bun the most! I will dip it into the condensed milk and eat with it. Super super super super yummy! 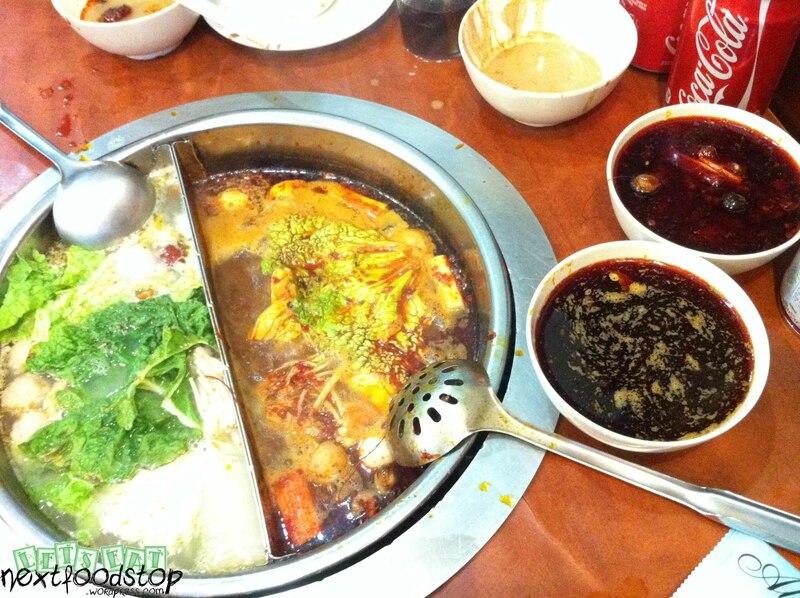 “The numbing-spicy hotpot, actually comprises many different layers and suites of flavours. First there is the fat, which may be vegetable oil, lard, beef fat or a mix. Two bean condiments are essential: Pixian doubanjiang, fermented chilli-broad bean paste from Sichuan’s Pixian county, which has a lilting floral kick; and dark grey-brown douchi, aged fermented soybeans, which have a deep umami savour and are often labelled “lobster sauce” despite not containing lobster. 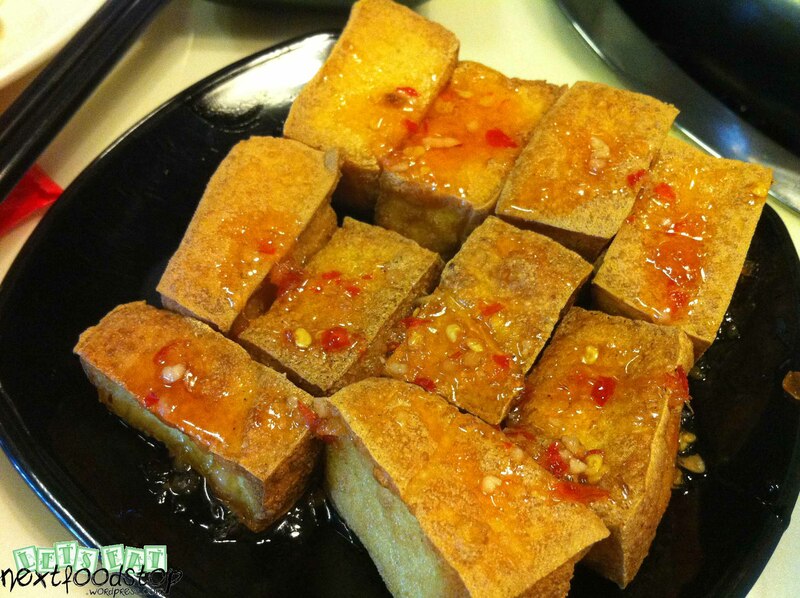 You can find these at Yue Hwa Chinese Products in Chinatown or at small Chinese supermarts blooking around Geylang. Fresh spices include ginger, garlic and Chinese leek (xiaocong). 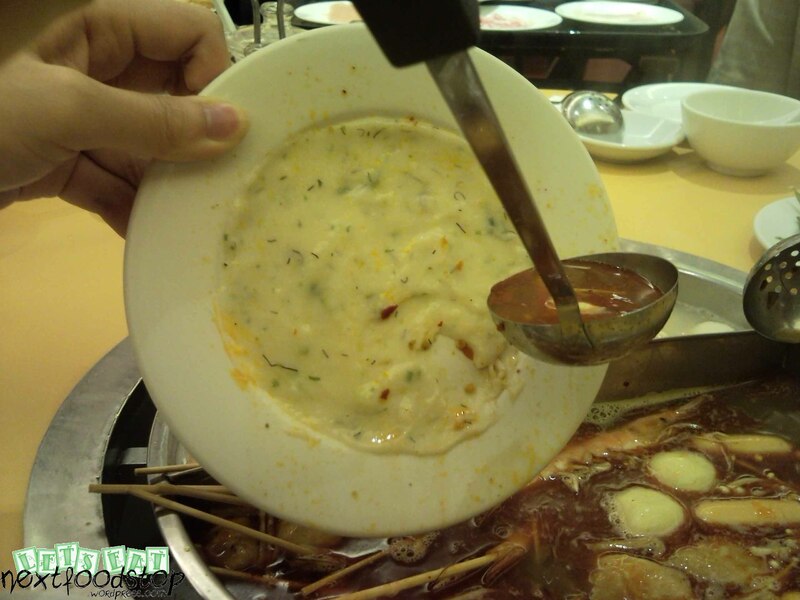 The exact blend of dried spices are top secret and proprietary to each mala huoguo restaurant. Stubby dried Sichuan chillies and Sichuan peppercorns are a given. Other spices may include black and white pepper, star anise, dried tangerine peel, cassia, cloves, fennel seed, brown cardamom, cekur root (called sand ginger or shan nai), chuanxiong (ligusticum), liquorice, and sometimes rather more esoteric ones such as long pepper or swamp loosestrife. 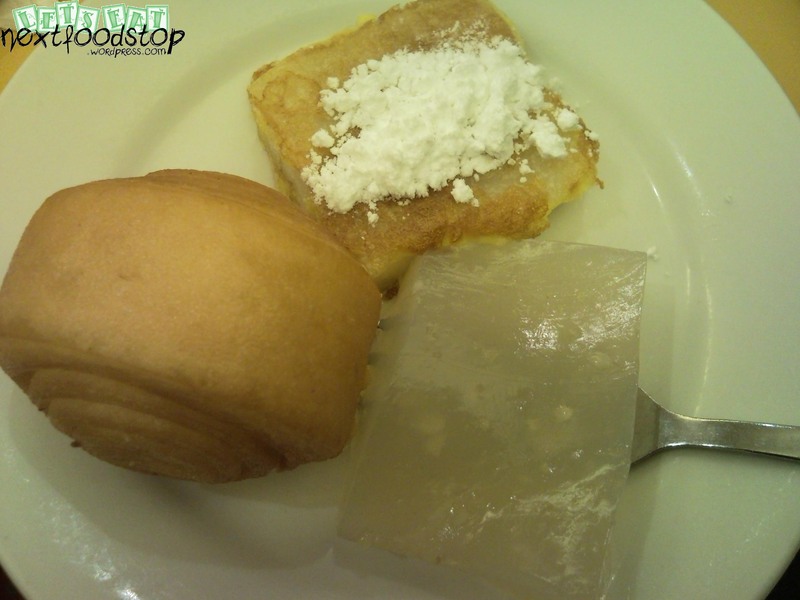 Sweetness and fragrance come from rock sugar, rice wine and glutinous rice wine. The base stock may be made with beef bones, chicken bones, pork bones or ham. 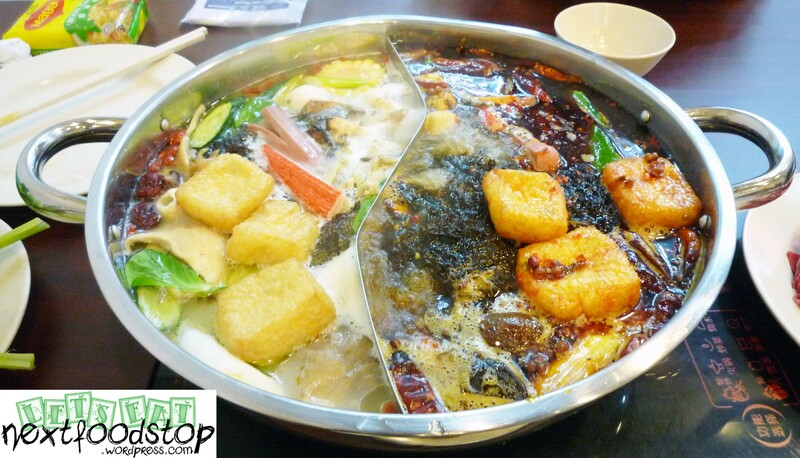 It can be tailored to match the main ingredients that will later be cooked in the hotpot. For the final assembly: first, simmer the dried chillies briefly in oil to extract their aroma, then set this mixture aside. Next, fry the Pixian doubanjiang in fresh fat for a minute or two over low to medium heat, to bring out its aroma without scorching it. Add the fresh spices and minced douchi and fry them likewise, then stir in the dried spices, stock, sugar and wine. Simmer for a few minutes, then add the chillies-in-oil, and finally simmer everything for several minutes to integrate the flavours.